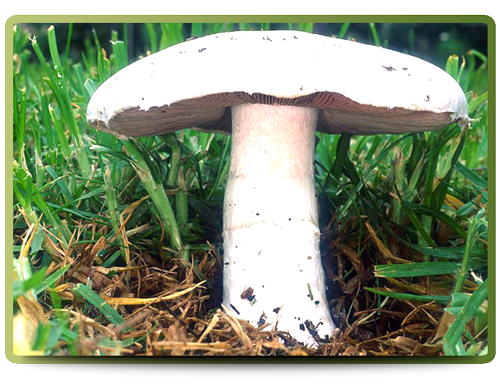 The Field mushroom has a white cap and may have fine scales. The cap is 5 to 10 centimeters in diameter. When the cap first opens, it is hemispherical in shape then flattens as it matures. The gills on the underside of the cap are initially pink, then turn reddish-brown and finally turn a dark brown as it matures. The spore print is dark brown. The stipe grows 3 to 10 centimeters tall and is predominately white and bears a single thin ring. The Field mushroom has a mild taste. The mushroom's white flesh bruises slightly reddish, as opposed to yellow in the inedible which is somewhat toxic. LOOK OUT for yellow bruising! This mushroom is commonly found in fields and grassy areas after rainfall from late summer onward.